Spencer is a weekly columnist for PJ Media and FrontPage Magazine, and has written many hundreds of articles about jihad and Islamic terrorism. His articles on Islam and other topics have appeared in the Los Angeles Times, the San Francisco Examiner, the New York Post, the Washington Times, the Dallas Morning News, Fox News Opinion, National Review, The Hill, the Detroit News, TownHall.com, Real Clear Religion, the Daily Caller, the New Criterion, the Journal of International Security Affairs, the UK’s Guardian, Canada’s National Post, Middle East Quarterly, WorldNet Daily, First Things, Insight in the News, Aleteia, and many other journals. For nearly ten years Spencer wrote the weekly Jihad Watch column at Human Events. He has also served as a contributing writer to the Investigative Project on Terrorism and as an Adjunct Fellow with the Free Congress Foundation. Spencer has appeared on the BBC, ABC News, CNN, FoxNews’s O’Reilly Factor, Megyn Kelly’s The Kelly File, the Sean Hannity Show, Geraldo Rivera Reports, the Glenn Beck Show, Fox and Friends, America’s News HQ and many other Fox programs, PBS, MSNBC, CNBC, C-Span, CTV News, France24, Voice of Russia and Croatia National Television (HTV), as well as on numerous radio programs including The Sean Hannity Show, Bill O’Reilly’s Radio Factor, The Mark Levin Show, The Laura Ingraham Show, The Herman Cain Show, The Joe Piscopo Show, The Howie Carr Show, The Curt Schilling Show, Bill Bennett’s Morning in America, Michael Savage’s Savage Nation, The Alan Colmes Show, The G. Gordon Liddy Show, The Neal Boortz Show, The Michael Medved Show, The Michael Reagan Show, The Rusty Humphries Show, The Larry Elder Show, The Peter Boyles Show, Vatican Radio, and many others. 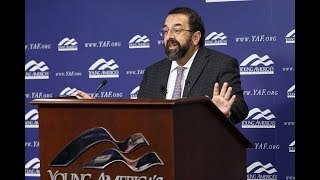 Robert Spencer has been a featured speaker at the University of California-Irvine, Temple University, Dartmouth College, Penn State University, the University of California-Los Angeles, Stanford University, New York University, Brown University, the University of North Carolina at Chapel Hill, the University of Virginia, State University of New York-Binghamton, State University of New York-Stony Brook, Florida State University, DePaul University, the College of William and Mary, Washington University of St. Louis, the University of Wisconsin at Madison, the University of Wisconsin at Milwaukee, Boise State University, Cal Poly, Portland State University, and many other colleges and universities. He has also addressed the Heritage Foundation, the Simon Wiesenthal Center’s Museum of Tolerance in New York City, the Hudson Institute, the Temple of the Arts in Los Angeles, the San Diego Jewish Book Fair, the Young Presidents’ Organization, Calvary Chapel Pacific Coast, the Conservative Political Action Conference (CPAC), FreedomFest, Young America’s Foundation, Hershey’s Sweet Retreat, the John W. Pope Civitas Institute, the Conservative Forum of Silicon Valley, Train the Trainer, and many other audiences.